Dr. T. V. Ajay Krishna from Ahmadabad, BVSC Graduate. STRATEGY MAKING SALES SUPPORT TECHNOCAL TRAINING VETERINARY HEALTH CA.. VETERINARY MEDICINE ..
are one of expert skill area's of Dr. T. V. Ajay Krishna . 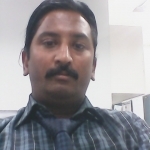 Dr. T. V. Ajay Krishna is working in Sales Marketing industry.